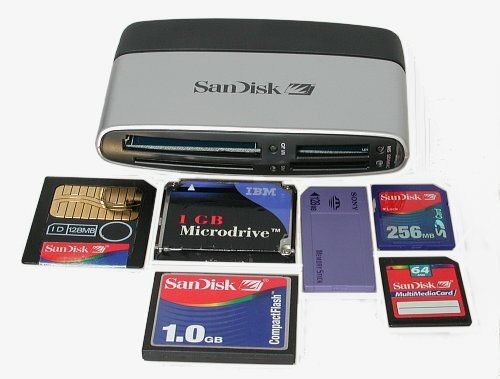 October 2003 update: SanDisk has updated the ImageMate to an 8-in-1 device now as it handles xD-Picture Card and Memory Stick Pro media as well as the original six flash media types. SanDisk's ImageMate 8-in-1 is a priceless peripheral for today's digicam or multimedia users. If you're like me you change digicams and storage media frequently, now you only need one card reader. The ImageMate 8-in-1's four slots can simultaneously accommodate CompactFlash Type I or II cards, SmartMedia, Memory Stick, Memory Stick Pro, Secure Digital, MultiMedia cards and xD-Picture Cards � just stick your card in the appropriate slot and go! (Note that Sandisk does not recommend it for use with Microdrives). The ImageMate 8-in-1 is a high speed USB 2.0 device and is capable of transfer rates as high as 480 Megabits per second. When used with older systems it's backwards compatible with the USB 1.1 standards but the transfer rate drops to a maximum of 12 Megabits per second. This card reader / writer is also perfect for those with MP3 players, PDA's and mobile phones as well as digital cameras or camcorders. Anybody that transfers or stores data on flash memory cards or Microdrives will love the ImageMate 8-in-1. It's true Plug and Play with USB Mass Storage Class (MSC) compliance when used with Windows ME, Windows 2000, Windows XP and Mac OS 10.1.2+ systems. Drivers are included for computers equipped with Windows 98SE, Windows 2000 or Mac OS 9.x operating systems. The four card slots appear as individual removable drives so you can move data between different flash memory devices as well as to and from your hard drive. Shown above is the My Computer display of my drives. The removable disks G, H, I, and J are the SanDisk ImageMate 8-in-1. It can get a little confusing as to which drive is which sometimes but in Windows XP you can set it to auto-launch Explorer whenever a card is inserted. The installation was quick and easy on my Pentium 4/2000MHz machine running Windows XP Pro with a USB 2.0 add-in PCI card. I just plugged it in and after a minute Windows had finished detecting and installing the four new devices and it was ready for use. No drivers were required whatsoever. 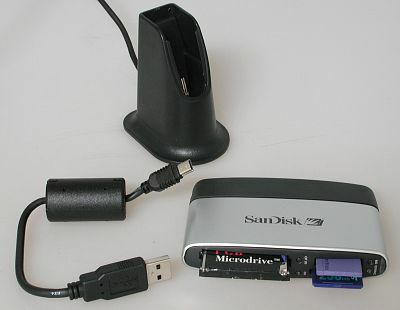 The USB 2.0 data transfer is rated at up to 480Mbps but the actual transfer rate is dependant on your computer's processor speed, the USB port (and/or hub) and more importantly, the speed of the flash memory device being accessed. Suffice it to say that the ImageMate 8-in-1 when used with a USB 2.0 port is always MUCH faster than using the USB built into your camera. The ImageMate 8-in-1 is powered directly from the USB port, no external power supply required. It comes with a desktop docking station and a 3-foot USB cable. Each of the four drive slots has its own LED indicator that lights up when a card is inserted. When undocked the ImageMate 8-in-1 is smaller than a mouse so it's great for going along with your laptop. SanDisk includes a "shorty" USB cable just for this purpose. The bottom line - at $49.95 (or less) it's one of the most versatile and least inexpensive card readers on the market. It's also one of the fastest card readers available today. It worked flawlessly when connected directly to my USB 2.0 card, it operated intermittently when plugged into my Adaptec 7-port USB 2.0 hub. It directly reads and writes to every type of flash media used in digital cameras today and the few new types (Memory Stick Duo, Mini-SD) can be used with their proprietary adapters. 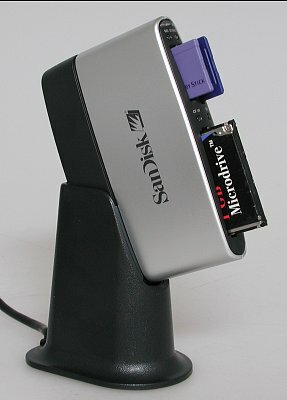 We originally tested and reported that this card reader worked perfectly with the 1GB IBM Microdrive -- it still does for me, however Sandisk has officially recommended not using Microdrives with this reader. In some cases the Microdrive can draw more power than what is available on the USB bus port. This can cause damage to the drive, the reader or the PC. Once you have used a USB 2.0 card reader you'll never want to go back to the slow USB 1.1 speeds again. 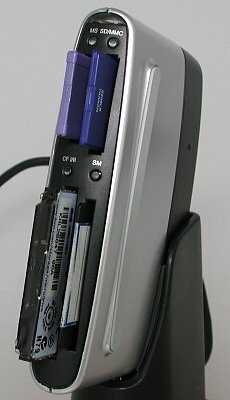 You may not notice a lot of difference when you upgrade from a Pentium 1.2GHz to a Pentium 2.0GHz computer but believe me, you'll immediately notice the difference in transfer speed between USB 1.1 and USB 2.0 card readers! If you don't have USB 2.0 it can be added to existing PC/Windows systems with an open PCI card slot for as little as $20. Most all of the new desktop and notebook computers sold now and in the future will include USB 2.0 right out of the box.